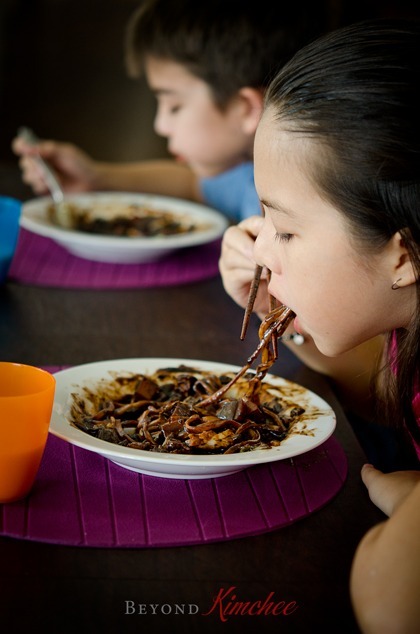 Before the McDonald landed in Korea, or Pizza Hut invaded with Bulgogi pizza to change the taste buds of Korean children from kimchi pancakes to pizza, there was a noodle dish called “Jjajangmyun“. Jjajangmyun used to be the all time Korean kid’s favorite food. At least to me, it was. The dish was known as the special treat to the children when they had done something really good; like getting an A in their school report or finishing their piano lesson to a certain level. It is a nostalgic food to every Koreans above 30+ years old. I don’t remember my mom making this noodles at home. She never bothered to make it because it was easily, quickly, and inexpensively accessible. Like a box of pizza that we order as a take-out these days, this Jjajangmyun was often delivered to everyone’s home. 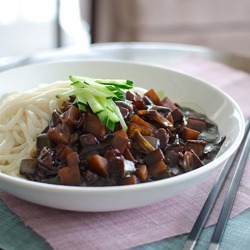 Jjajangmyun is actually a Chinese noodle dish, made with black bean paste in the sauce. For some reason the dish have evolved a little differently in Korea than it was in China, and became very popular among Koreans. I have tried in Hong Kong and Taiwan with their version but I prefer the way Koreans make. If you don’t have the Korean style Chinese restaurants in your area, you will be glad that you found this recipe. It is quite easy to make. 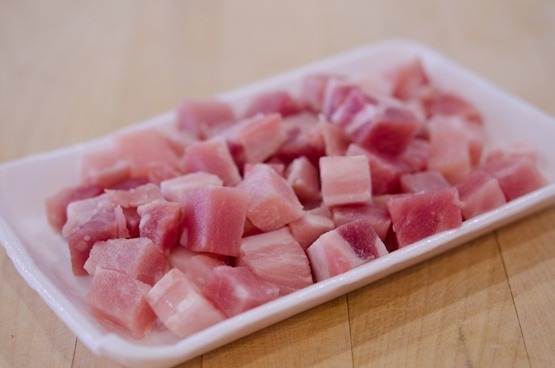 First you will need some cubed pork (about 1/2″). Any pork cut is okay-la. Dice your vegetables, all in cubed shapes. Cabbage, onion, potato, and zucchini are my chosen ones. Now, there are two types of black bean base sauce. One is in powdered form and the other in paste. My advice? Get the paste. Although the powder is easier to cook with, I found the paste yields better taste. You want to fry the paste in prior to make sauce. That way it will remove some bitterness of the black bean paste. It looks like there’s awful amounts of oil, but the sauce doesn’t soak up much oil. Fry the paste with 1 tablespoon of sugar for 3-4 minutes over the medium heat. As you see, the oil and the paste don’t mingle together. UPDATE (Apr/6/2014) : You can find Korean black bean pastes that has been pre-roasted in most Korean stores these days. Using pre-roasted paste will eliminate this frying step. How nice! With a slotted spoon transfer the sauce to a bowl and set aside. Discard oil in the pan except 1 tablespoonful to remain. 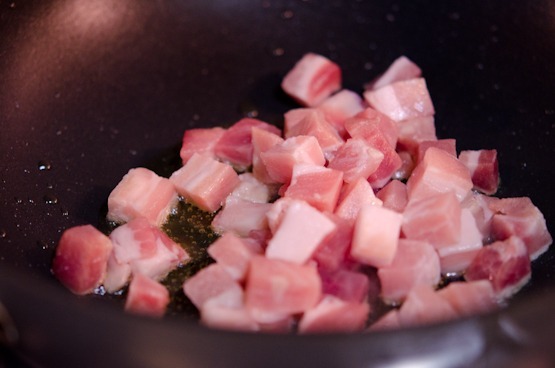 Saute your pork until they are no longer shy in pink. 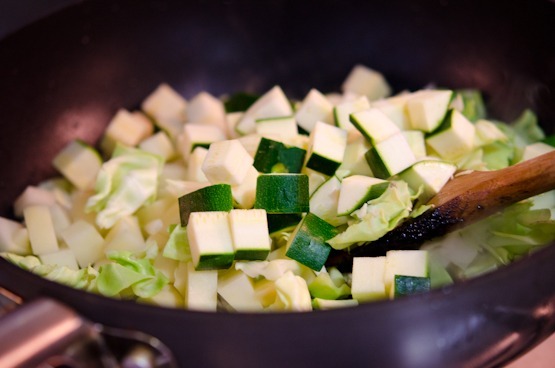 Dump all your vegetables and continue to saute to 2-3 minutes. 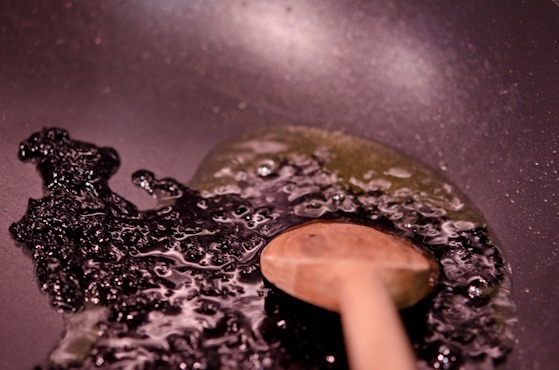 Return your black bean paste and 1.5 cup of water to the pan. Add more water if you prefer thinner sauce. I sometimes add a little bit oyster sauce to bring more flavor, but not today. Simply because I was lazy to go outside to buy a bottle. Anyway, stir the sauce well to incorporate. Bring to boil first, then simmer for 3-5 minutes or until they are tender. And add to the pot. Stir and continue to cook, about 2-3 minutes. The sauce will get thicken. Here it is, the beautifully thickened Jjajangmyun sauce! Oh, do you feel the dark side of the force? I do. Here are Jjajangmyun noodles. You will find them in a freezer section of Korean stores. 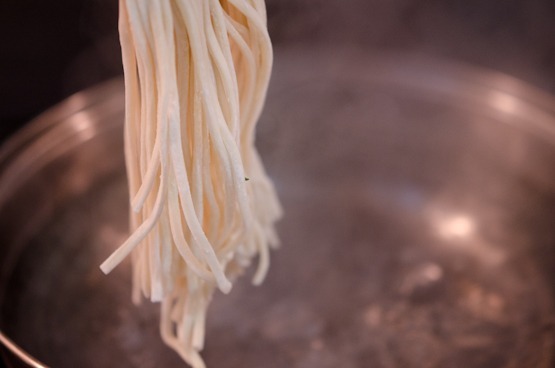 Or you can use any thick wheat noodles, even Spaghetti or Fettuccine. Add to the boiling water and cook according to your package direction, about 6 minutes. Drain. I like to rinse them with hot water. My gluten loaded noodles are ready to take an action. 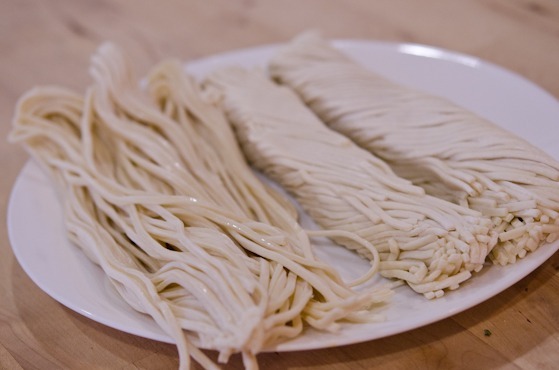 Place these chewy noodles in a large shallow bowl and pour the sauce over. Mix like crazy with your chopsticks. And eat. You will absolutely need some napkins. Many actually. It is not easy to eat this dark-forced noodles without making the slurping noise but, hey! that is life. People will understand. My kids absolutely love this. Hope you love it, too. 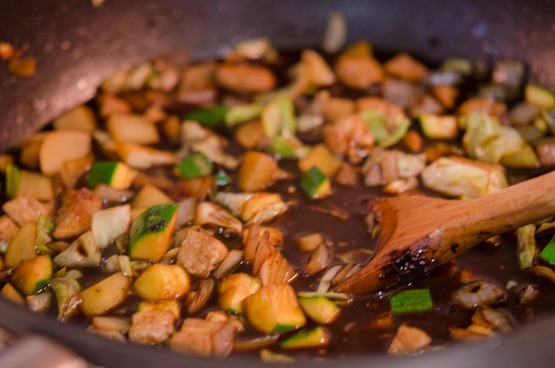 In a wok or skillet heat oil over medium heat, add the bean paste and sugar and stir fry together for 3-4 minutes. The oil and the paste won't get mixed. 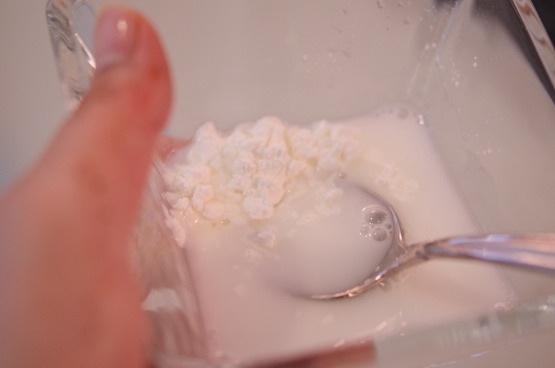 Using slotted spoon, scoop up the paste to drain the oil and transfer to a bowl. Set aside. Discard the rest of oil except 1 tablespoon remaining in a skillet. Add the pork and cook until no longer in pink. Add cabbage, onion, zucchini, and potato and stir fry until somewhat soft. Add the black bean paste back to the skillet and mix. Add oyster sauce if your desire. Pour 1 1/2cup of water and bring everything to boil, reduce the heat to simmer until everything is tender yet retain their shape, about 3-5 minutes. Season with salt or soy sauce if needed. Meanwhile bring a pot of water to boil. Add the noodles and cook according to the package direction, usually about 6-7 minutes. 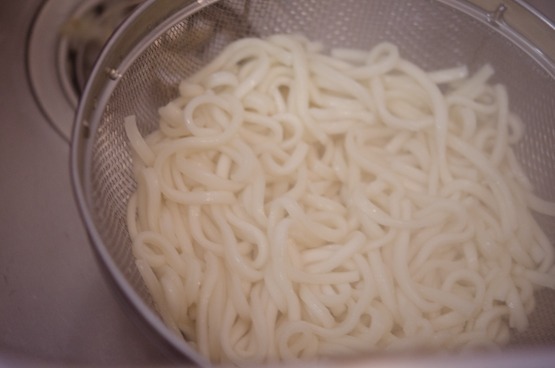 Drain the noodles and rinse once with hot water to remove excess starch. Place noodles in a large shallow individual serving bowl and pour the sauce over. Garnish with cucumber slices. Serve hot. Gosh, this has such terrific color! And the flavors sound wonderful - I love black bean sauce. And anything with noodles in it certainly gets my attention. ;-) Great dish. And when I eat it, I know already I'll be making slurping noises! Hello! Would you like to share your recipes on http://whenangelscook.com? Check it out :) already great presence on FB, twitter and Pinterest - http://pinterest.com/gabrielle8008/when-angels-cook/ - would love to see your recipes :) - it is new and will grow because of you! It would be great to have you and your recipes on board. I can hardly wait to try this! I just discovered your blog about 2 or 3 weeks ago, and absolutely love your dishes AND your pictures. You make it soooo easy to do South-Asian/Korean food right at home. I cannot say thank you enough! Mmmmm! Yes! I prefer Jjajjangbap with a fried egg on top, but either way it's so good. 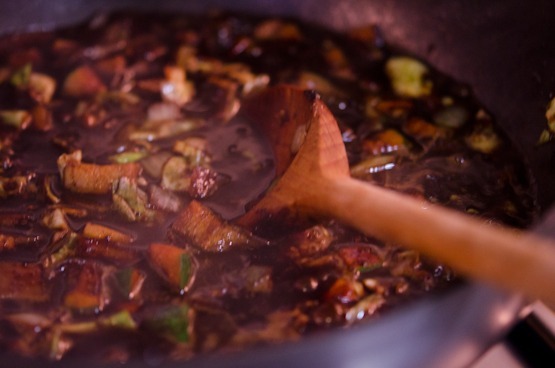 Oh, I love jjajangmyun, and your photos are absolutely mouthwatering! I just don't eat it very often since it's stuck in my mind that it is not healthy food...especially with the step of frying the sauce in oil. Actually, I've always been curious about this frying step; if the point is to cook the paste at high temperature (as would be the case with the oil-frying) to remove the bitter taste, couldn't this oil-frying step be omitted and instead replaced with just boiling the sauce (also high temperature cooking) at a later step, without adding the original frying oil? Or is there something about this oil-frying technique that I am not understanding? I have tried making jjajangmyun with my boiling idea (no frying), and I did not notice a bitter taste. But even though it tasted good and was a little healthier, I felt guilty for not making it the traditional Korean way. Can you help me understand this frying step a little better? Hi Erica As you know, the reason we fry the paste in oil is to remove the bitterness and the rawness from the wheat flour that had been added to the paste. The frying in oil also help create some nutty flavor in the sauce as well. You can certainly use boiling method but the overall flavor of the sauce won't be as tasty. You know fat makes the flavor. 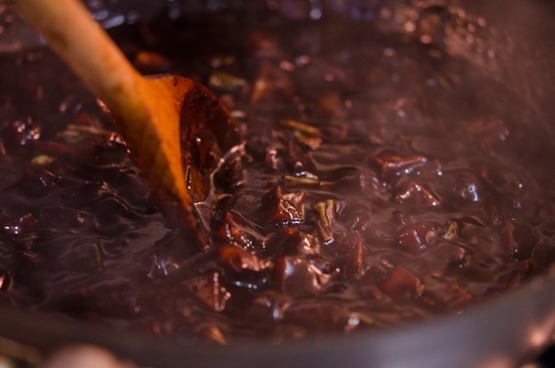 If you go to the popluar Jjajangmyun restaurants, chances are they will use lots of shortening or even lard to fry their paste to make the sauce. Some even add MSG to bring more flavor. For that reason Jjajangmyun is known for unhealthy. Although I grow up eating restaurant Jjajangmyun often, I don't like to feed my family the noodles made with unhealthy fat. You can make the dish a lot healthier at home. (However I do have the occasional craving of the old time restaurant flavor though) As you follow my recipe, you fry the paste in oil - the paste doesn't soak up the oil much, then drain the most oil except just a little to fry the rest of the ingredients. Use healthy oil such as grape seeds or canola, and it shouldn't be too bad. I hope I answered your question alright. Thanks, Holly, yes, your explanation is so nice! ^_^ I guess I have been shy of trying the frying step, but with your helpful guidance maybe I will try it sometime at home. Have a great rest of the week! YUM! A recipe for jjajangmyeon...so exciting as we haven't had this since leaving Korea for fear that any versions not be the same as we're used to. This one looks pretty damn authentic. Thanks!!! My kids love jajangmyun too!! Yours looks great! When I was a child, I could not eat enough of this! I still love eating Jjajangmyun! This is one of my favorite Korean food!! Yay for the authentic recipe. Thanks Holly! I love that this simple, savory meal is considered a special treat in Korea! Black bean sauce is one of my favorite flavors. I can't wait to try this. I love Jjajangmyun. I first had it when I was in Hawaii for my studies. But when I moved back to Malaysia, all I could find was those instant noodle kind. And for years that had been the only Jjajangmyun I get to eat in Malaysia. Then I went to Korea last year and I realized the instant noodle kind does not even come close to the ones I ate in Korea. I actually ate it a couple nights in a row as to get as much Jjajangmyun as I can before coming back to Malaysia. Thank you for sharing the recipe. Now I can go get the ingredients and make my own Jjajangmyun at home. Thank you so much. As always, your recipes never disappoint! I made this for dinner last night and my husband (who spent a number of years in Korea) said, “I can’t believe can cook like this and you’ve never been to Korea”. That is a compliment to you, Holly; your step-by-step instructions make it an easy dish to prepare. 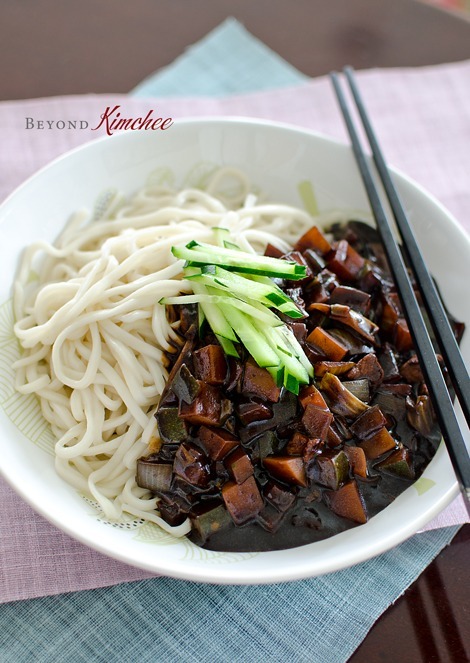 The distinctive black bean flavor with the texture of the noodles makes it addictive. Leah Baik is right—an egg on top would have been fabulous, but we enjoyed it without. I love your recipes, Holly. Thanks for sharing. Nancy, I am so happy to hear you made this noodles and your husband complimented. Thanks for your sweet comment. I appreciate it. So great to hear your children liked the noodles! I really love korean food,but i live in india.do u know of any way i could lay my hands on the bean paste u mentioned? You can use Chinese black bean paste if you have access to Chinese groceries. Great recipe, thanks! Made it today and it was absolutely delicious. Will make it again soon for sure. Jjajangmyun is not sweet. The black bean paste itself has plenty of salt in it but you can always add some salt for your taste. Hi Holly! I am dying for some jjajangmyun - have been craving it. But, I am now eating vegan and am hoping to adapt it to a more oil-free vegan style by omitting the oyster sauce and pork. But Is the oil absolutely needed? I plan on sautéing the vegetables in water, like I normally do, but is the black bean paste absolutely needing to be sautéed with oil? Thanks so much! Can't wait to try! I would recommend you to use the powdered form of black bean instead of paste. With the powder you don't need the sauteing. You can make this noodle into vegan dish as you like. If you can't find the powder, you will need to saute in oil to get rid of the bitterness. You can boil, of course. But it won't taste as good. A little bit of healthy oil like grape seed oil or canola oil will make the dish more flavorful. I used black bean paste that was labeled: "Black Bean Paste / Roasted" (Brand was Haioreum). I assumed it had been pre-roasted so I skipped the step where you sautee the black bean paste and the result tasted fine to me. Hello~ i cant eat pork so can i change it to meat or anything else? You can try with ground beef. Thank you ! I think you nailed this recipe. Was looking around for a good jajang myun recipe. Tried one from a different site and it was pretty off. Your recipe captured the flavors and textures I remember. I used cube bellies for the meat and substituted potato starch in place of the cornstarch to avoid that chalky taste that cornstarch sometimes seems to add.. This looks so good. I found you on Pinterest and having never even had this dish, I can't wait to make it. How many ounces of noodles serves 4? Thanks! 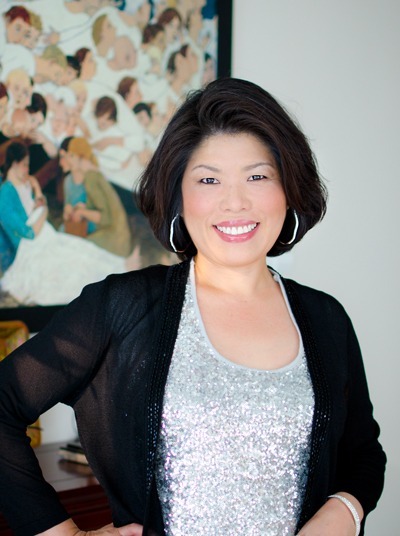 Dear Holly, I love your blog! There is an HMart in my area. What aisle/section of the store can I find the Chinese black bean paste? I have asked a couple of workers there and it seems they really don't know where things are. Thanks! Black bean pastes should be in a condiment aisle where you see Korean pastes. 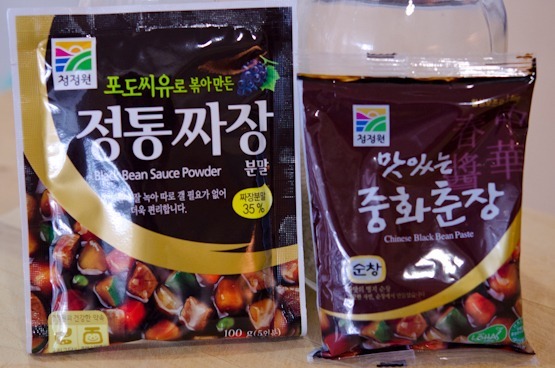 Korean style black bean paste should be next to Korean soy bean pastes, and the Chinese black bean pastes are usually displayed across the aisle. I have seen Korean black bean pastes that are already pre-roasted so that you don't need to fry-up to get rid of the bitterness. Have a fun shopping! I made this last night, but used clear noodles I had purchased for another recipe (which I now cannot find!). I was trying to get rice noodles originally, and these had beans and peas as the ingredients. ??? In any case, it was very good. Next time, I'll make it spicier, and replace the potatoes with something else. I'm also going to try to find authentic bean paste at the Asian grocery store. The only kind I found in the regular grocery store was Kikkoman brand. I am glad that this recipe turns out well with clear noodles. Making it spicier sounds great, too. Had the Chinese jajiangmian on a side street in Taipei Taiwan, and it was unforgettable even after several decades! This recipe was really helpful and it even provided pictures on the website on each step, so it made it even easier to follow. Although we followed the final product, our picture didn't turn out so much like the professional picture, which is okay. It tasted really good and my friends said it tasted like their parents' jjajangmyun! We altered the noodles and the brand of the black bean paste because we couldn't find the Korean brands of the noodle and paste. 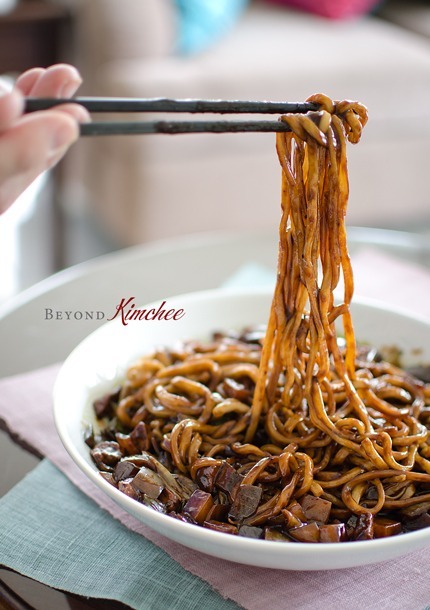 We went went Chinese black bean paste and replaced the Korean noodles with spaghetti noodles because we could get that at our local food market. We used half wheat spaghetti noodles and white noodles. It turned out pretty well, although our color wasn't the same as the picture. Our toppings and everything were more brownish than blackish. Either way, once again, it was delicious. What I would do differently is maybe just go for the Korean brand ingredients, if it wasn't for the fact that I lived far from the Korean market and so on. 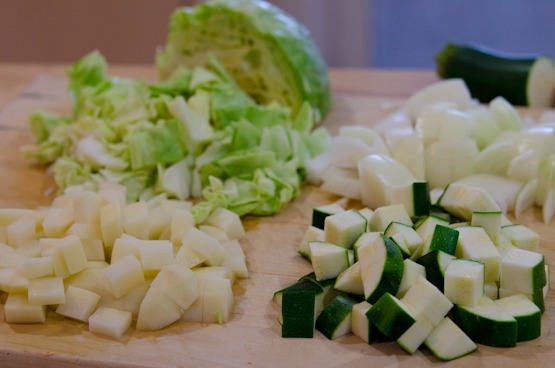 I would also measure the toppings that we used more, instead of rushing it and going with what looked right in my eyes since it's hard to measure how much cabbage we could have used with me eyes. This is what the final product looked like: noodles good, and the toppings were overflowing. Cucumbers tasted good as well. I would always recommend this recipe to someone. Just because I couldn't do it, doesn't mean that someone else couldn't. If you use spaghetti noodles, I think you really miss much of what makes the dish taste so good. The noodles need to have that chewy, firm taste. Two Korean fresh noodle brands that work pretty well for me are: Assi and Choripdong. And actually, I've used fresh lomein noodles (brand Twin Marquis) with good results. You can get Korean black bean paste online from hwww.mart.com -- search for 'black bean paste' there. I think the brand I used was Haioreum. This recipe was pretty awesome. The instructions were easy to follow. The final product looked really close to the pictures on here and it tasted really good. There are some parts where we had to change the amount of stuff we had to put in, for example the amount of black bean sauce, there wasn’t enough black bean sauce to coat the noodles so we added a little bit more in. In the end it had a more of the color that is usually seen with jjajangmyun. It looked brown and really sticking and gooey looking, just the way I like it. This recipe was pretty good, nice and clear instructions and good amounts of stuff to make it, the only thing is that we changed the amount of black bean sauce. This recipe was easy and simple to follow which it made it very helpful. The final product of this recipe did not turn out to be like the professional picture. We had to substitute some ingredients like the Korean black bean paste with Chinese black bean sauce. The noodles were also substituted with spaghetti because it was something that we could find at our local supermarket. These substitutions didn’t really change the recipe that much but the color of the sauce was different. The color of our dish turned out brownish but that was due to the paste sauce we used. Even though we had those substitutions, the recipe turned out really good and it also taste very good. If I had to redo this, I would like to have slimmed down some of the portions of the vegetables because it was just too much. I would also like to use Asian noodles and the Korean brand black bean sauce instead to see if it would have tasted any differently. The final product consists of noodles on the bottom with the black bean sauce mixed with vegetables and pork layered on top. To top off the dish, we had fresh slices of cucumber. I would like to recommend this recipe to another person because it was a easy recipe that anyone can follow and our final dish turned out amazing. I just made this for dinner but I'm not really sure what it's supposed to taste like since I've never tried it before. Is jjajangmyun supposed to be sweet? Mine was a bit bland and the only flavour I could taste was salt. Is it because I didn't put enough black bean paste? 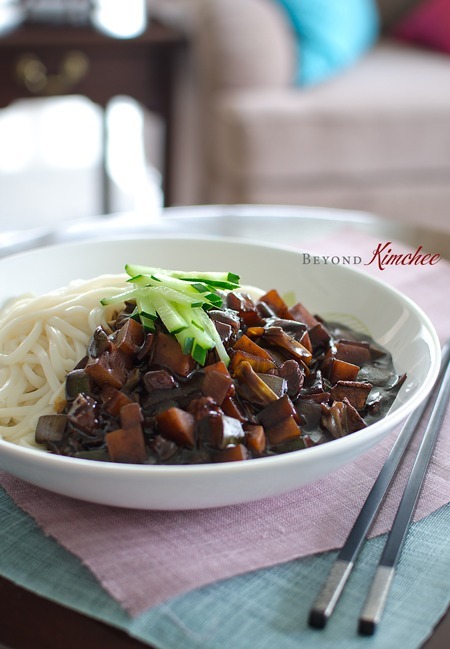 Jjajangmyun has mild yet distinctive its own flavor from the black bean paste. It is not spicy and can be very slight sweet but not much. If yours is salty, I wonder if you used the right kind of black bean paste. 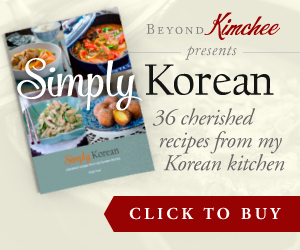 Did you use Korean style black bean paste? Hi ... I have a couple of questions. I am american but I grew up in Killeen Texas which just happens to have a very large amount of Koreans in the area because we are right next the ft hood army base and because of the u s army having a base in Korea many army guys married korean women and brought them to the US. I am white but I love Asian food because I had so much good Asian food I could order anytime. I LOVE this dish, I was going to make myself some the other day and asked my husband to get the black bean paste and he brought back black bean garlic paste ... Can I use that? Also I have tried to add oyster sauce in when I make Asian food and I really don't like it in my cooking at home but I like stuff with it like brown sauce and moo goo gai pan ... Is the stuff in the u a just bad or cod I be using it wrong ... How much is normal for a dish and how do you add it in? Hi Aubrey Hmmm..., the black bean garlic paste might not bring the same result because of the strong garlic taste in the sauce. You can definitely try it, though. Some like to add garlic in the sauce. 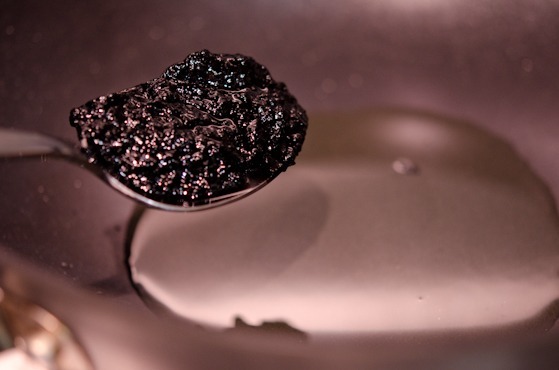 In any case, unless it is pre-roasted bean paste, try to fry the paste in the oil first to get rid of the bitterness. For the Oyster sauce, I am not sure if I understand your question right, but adding a little bit of oyster sauce can enhance the flavor of this noodle dish. For most other Asian dish, you don't want to overuse it, too. It is quite salty and not the healthiest condiment. I would say about 1 tablespoon per 4 serving recipe, but it can vary depends on the dish you are making. I am so glad to see this recipe! I've been craving it for 8 years ever since my sister-in-law visited and made it for me. I can't wait to get to cooking! Going to see what else I can find, I miss so much of my mother-in-law's cooking. Hope you get to find all the ingredients you need to make this recipe. It is one of the most requested noodle dish that my kids are asking for and even the grown-ups like it, too. Hope my recipe will turn out as good as your sister-in-law's. My husband lived in Korea for a number of years, and loves Korean food. This is one of his favorite dishes. I've never tried it at home. Lotte supermarket in Falls Church has a restaurant that makes it. But now, I need to try! Thanks for this recipe. Had this since I was in high school and just had a craving for this 10 years later. I really wanted to know how to make the sauce and didn't want to resort to buying instant noodles. hi. is the sauce originally sour? i've bought one and cooked but it make my noodles become sour taste. so i not sure is the sauce rotten or what. No, the sauce shouldn't be sour. Did you check the expiration date? I only got ottogi jjajang (3 minutes); I don't know what to do, What should I do? That is a ready-made sauce. You can just heat it up, and pour over noodles or rice and serve. I can't find any store that has black bean paste. I got all the ingredients except black bean paste. Is there a substitute for black bean paste? How much do you thing the recipe would change if I omitted the pork and used something like tofu instead? It won't have the same texture but I believe it will still taste good. I would fry the tofu to crisp before you add to the sauce though. Hi! My local supermarkets don't sell the black bean paste :( I could only get the black bean powder. May I know how do I cook with the powder form, please? Thank you very much! I would look for the instruction on the package. If not, after frying the meat and vegetables, add the powder and give it a good stir, and pour water to barely cover everything in a pan. The mount of powder is really depends on how deep flavor you desire. You can always add more so I would start with minimum amount for the serving size that you are making. Thank you for the recipe. I've been on a hunt for jjajangmyeon that tastes like those I had in Korea. I've tried many different recipes, but none had that particular flavor. I even rendered my own pork fat and used the lard to see if that was the secret, but it wasn't. what do they put in Korea to give it that particular flavor? I had this for the first time today in a restaurant and I'm hooked! What a wonderful meal for a dreary, cold Winter day. I'm very happy to have found this recipe - I can't wait to try it. Thank you!